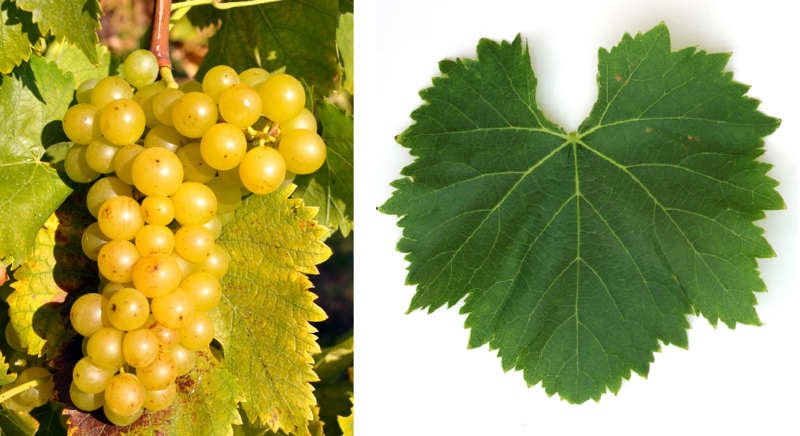 The white grape variety may come from Italy. Synonyms grouped alphabetically by country are Moscatel Amarillo ( Argentina ); Moscatel Amarilla? ( Chile ); Fior d'Arancio, Golden Muscat, Moscatel, Moscato della Siria, Moscato Giallo (second main name), Moscato Sirio, Muscatedda ( Italy ); Nutmeg Zuti ( Croatia ); Muscat Vert, Muscat du Pays ( Switzerland ). Despite seemingly indicative synonyms or morphological She may not share similarities Golden Muscat. Muscat Blanc or Muscat Fleur d'Oranger be confused. Loud Wine Grapes exists in 2001 DNA analysis a Parent-offspring relationship between Moscato Giallo and Muscat Blanc. In addition, in this work one Moscatel Amarillo as independent, to Criolla group mentioned variety. But there is a discrepancy to other sources. Because in the statistics of Kym Anderson Moscatel Amarillo (Argentina) and Moscatel Amarilla (Chile) are synonyms for Moscato Giallo. And in VIVC catalog is a variety Torontel with the synonym Moscatel Amarillo also given as an independent variety and a variety Moscato Giallo without descent. The early to middle-maturing, lockerbeerige Vine is resistant to Botrytis and limited to both mildews but prone to chlorosis and Black spots disease (Phomopsis). She brings golden, aromatic white wines nutmeg, The variety becomes under the name Goldmuskateller or Moscato Giallo mainly in the double region Trentino-Alto Adige, but also in Friuli-Venezia Giulia and Veneto grown. In 2010, Moscato Giallo stocks were in Argentina (133 ha), Brazil (126 ha), Chile (25 ha), Italy (1,127 ha) and Croatia (59 ha). Whether it is the same variety, but is unclear. This page was last modified at 2 January 2019 at 16:50.